Computer software which provides services for software applications and for all those available for the operating system is known as Middleware. It can also be defined as the software glue. It makes very easier for a software developer to perform functions like input as well as output functions and communication, so the developer can focus on some specific purpose / task of the application. It is the software which helps in connecting the software components or an enterprise application. Basically it is the software layer which is present between an operating system and applications on both sides of the network of distributed computer. Moreover, Middleware supports highly complex and distributed business software apps. 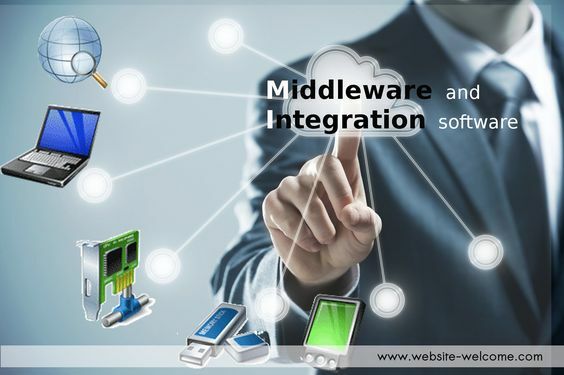 Integration software /middleware are an alternate word used for middleware because the main purpose of middleware is mostly integration. Integration software represents system software’s that provide runtime services which is used for communication integration, execution of applications, monitoring them and performing operations on it. The main goal / function of middleware are to provide /make application development simpler. Application development is made easy done by providing basic programming abstractions, heterogeneity cover up’s, operating system delivery and hardware, and hiding the details of low level programming. Cloud Integration integrates with and between cloud services, cloud based apps, private clouds, trade hubs and other cloud resources through different Web services and standard B2B communication strategies like, AS2, FTP. B2B Integration used to integrate the customers, service provider and different partner interfaces with a lot of data resources and applications managed by companies. Data Integration is basically used for integrating resources of business data, like databases, files, over businesses and intelligence systems. Enterprise service buses (ESB), Message passing, Remote procedure call (RPC) systems, (TP) Transaction processing monitors, Object request brokers (ORBs), Distributed computing environment and Database access systems are some of the standard middleware categories. As middleware links both the sides of an application, that’s why it is also known as plumbing. Web servers, servers for applications, content management systems, and similar other tools which support application development and its delivery. It is especially integral to information technology based on Extensible Markup Language, Simple Object Access, SOA, Web infrastructure, and Lightweight Directory Access Protocol is some examples of middleware.